Beijing - Table tennis legend Deng Yaping will soon be adding to her rich experience by taking a further step in her political career. Deng, 37, the former world and Olympic table tennis champion, has been nominated to serve as president of goso.cn, a news search engine launched by People's Daily in July, and as deputy secretary-general of People's Daily, the Beijing News reported on Monday. Gong Yuguo, vice-president of goso.cn, said although the appointment process has not officially been completed, Deng would soon assume her new roles. "All the positions have now been filled, but Deng has not started work yet," Southern Metropolis Daily quoted Gong as having said. "I am waiting for the official announcement before I communicate with her about her new jobs." Deng herself declined to comment on the appointments, saying she was waiting for them to be confirmed. The turning point in the sports icon's career has nevertheless attracted media attention. According to a report in the Beijing News, People's Daily made an internal announcement about Deng's appointments last week and is waiting for feedback. If confirmed, the new positions, at the department level in China's bureaucratic hierarchy, will be a further step in Deng's political career. Deng currently serves as deputy secretary of the Beijing Municipal Committee of the Communist Youth League of China, a role at the deputy department level. 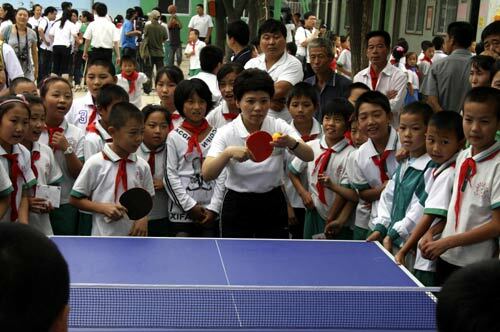 After picking up table tennis at the age of 5, Deng went on to earn a reputation as one of the world's greatest women's players in the history of the game. In a sporting career spanning two decades, Deng won more titles than any other paddler. At the time of her retirement from the sport in 1997, she had four Olympic gold medals and 18 world championship titles to her credit. She reigned as world No 1 from 1990 to 1997 and was voted China's female athlete of the century. In 2003, she entered the International Table Tennis Federation Hall of Fame. The direction her career took after retiring from the sport is even more astonishing. Deng studied English literature at Beijing's renowned Tsinghua University and earned her master's degree in contemporary Chinese studies from the University of Nottingham in England. Upon graduation, Deng went to work at the State General Administration of Sports and in 2007 accepted the position of deputy director of the Olympic Village department of the Beijing Organizing Committee for the Olympic Games. In 2008, she received her PhD in economics from Cambridge University. The title of her thesis was The Impact of the Olympic Games on Chinese Development: A Multi-Disciplinary Analysis. Following the Beijing 2008 Olympic Games, in April 2009 Deng accepted a job as deputy secretary of the Beijing Municipal Committee of the Communist Youth League of China, her first step into the political arena. Commenting on Deng's new positions, Gong said she was a highly capable woman. "Deng is not a layperson. She received a doctorate in economics from Cambridge," Gong said. "Her fighting spirit as an athlete and the experience she acquired working on the Olympics will, undoubtedly, bring a new perspective to the roles." An official announcement on Deng's appointments is expected after the National Day Holiday, which begins on Oct 1.